The WSGI Model 755 SRM is the latest-generation superconducting rock magnetometer equipped with an in-line alternating field demagnetizer (up to 200 mT peak field) and an automatic sample manipulator. The SRM features high-sensitivity DC SQUID sensors with a magnetic dipole moment noise level less than 10-12 Am2 (10-9 emu) RMS per root Hz and a wide dynamic range (10-12 to 2 x 10-4 Am2 analogue, 10-12 to 2 x 10-3 Am2 digital flux). This instrument is used primarily for measurements of remanent magnetization, either natural (NRM) or acquired in a laboratory field. Sequences of stepwise AF demagnetization and remanence measurements can be easily programmed by the user, allowing for fast and fully automated acquisition of demagnetization data. Due to its high sensitivity, the SRM is suitable for measuring magnetic remanence in very weakly magnetized whole-rock specimens and single crystals. The automated AGICO JR-6A magnetometer is the most sensitive instrument for measurements of remanent magnetization based on classical (non-quantum) principles. Dual rotation speed (87.7 and 16.7 rps) allows for adjusting the instrument sensitivity, with the maximum sensitivity of 2 x 10-6 A/m (at the higher speed) and the maximum measuring range up to 12500 A/m at the lower speed. The JR-6A is normally used for strongly magnetized specimens and for samples exposed to isothermal remanent magnetizations. 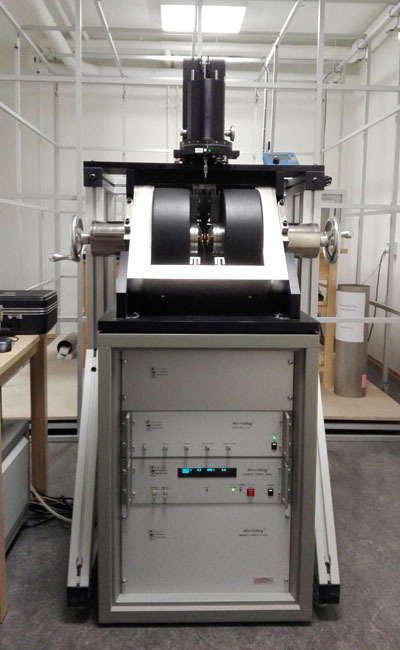 This instrument is an essential companion to the SRM described above, since SQUID systems generally have a maximum measuring range of a few A/m, which can be insufficient for strongly magnetized samples (e.g., igneous rocks). Alternating field (AF) demagnetization is one of the principal techniques used in paleomagnetism in order to isolate the characteristic components of the natural remanent magnetization. AF demagnetization may also be used to remove laboratory imparted magnetizations resulting from rock magnetic experiments. The LDA-5 is an automated, computer-controlled AF demagnetizer that is primarily used to demagnetize rock samples by exposing them to AF fields up to 200 mT. In addition, our LDA-5 demagnetizer is equipped with the PAM-1 magnetizer that can be used to impart anhysteretic or isothermal magnetizations in rock magnetic experiments. The maximum direct magnetizing field is 20 mT in the pulse mode, and 500 μT in the anhysteretic mode. 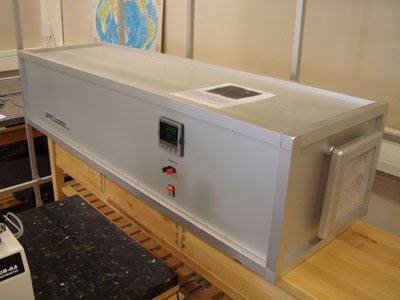 Thermal demagnetization (TD) is another technique commonly used in paleomagnetism to remove secondary magnetization components, by heating rock specimens in a magnetically-shielded oven. The MMTD80A is an automatic, microprocessor-controlled thermal demagnetizer with programmable heating, dwelling and cooling rates, a sample load up to 80 specimens, and an 800 °C maximum heating temperature. 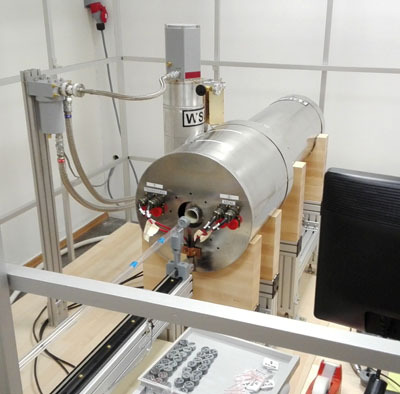 The demagnetizer is equipped with an internal calibrated solenoid for imparting thermal remanent magnetizations (TRM), providing the capability of paleointensity measurements through Thellier experiments. 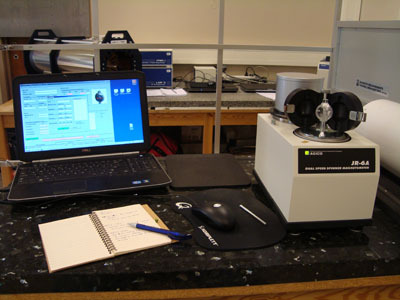 A controlled atmosphere sample holder allows for heating in Ar atmosphere to minimize sample alteration. 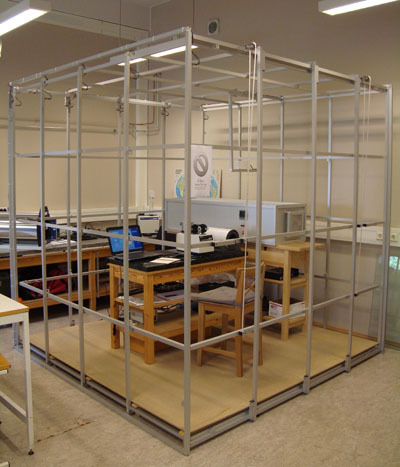 Two MMLFC shielded rooms has been installed in our laboratory to provide an extra layer of protection against acquisition of viscous remanent magnetization (VRM) during paleomagnetic experiments. The MMLFC is a cage consisting of 15 square coils that cancel the Earth's magnetic field and 50/60 Hz mains generated fields, creating a near zero magnetic field environment within its working volume. The magnetic compensation is automatically controlled by a 3-axis fluxgate magnetometer, and the residual field is on the order of 100 nT (note that the Earth's magnetic field is in the order of 50000 nT). One of the cages hosts the JR-6A spinner magnetometer and the MMTD80A demagnetizer, while the WSGI Model 755 SRM system is placed inside the second cage. A vibrating sample magnetometer is an extremely powerful tool for the analysis of magnetic properties of natural and artificial/synthetic samples through measurements of magnetic hysteresis loops, direct (induced) and remanent magnetizations as a function of the applied magnetic field, temperature and sample orientation. Rock magnetic applications of the VSM technique include characterization of magnetic domain states, remanence stability, magnetic interactions, magnetic anisotropy, and identification of magnetic minerals. The Lake Shore PMC MicroMag 3900 VSM is capable of measuring magnetic moments in a 50 μemu to 10 emu range (5 x 10-8 to 1 x 10-2 Am2) in an applied field up to 1.8 T (or up to 2.2 T with the room temperature setup). It is equipped with routines for automated measurements, including software for acquisition and analysis of First Order Reversal Curves (FORC). 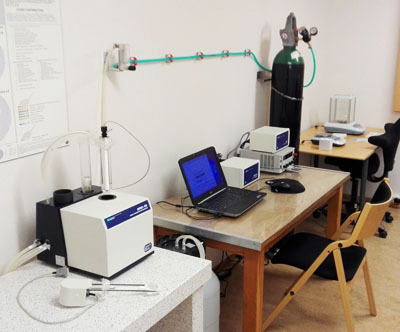 Both the high-temperature furnace and the low-temperature cryostat are available, allowing the user to conduct measurements from room temperature to 800 °C in Ar atmosphere (high-T option) and from 10 K (-263 °C) to room temperature (low-T option). The AGICO MFK1-FA Kappabridge (magnetic susceptibility meter) is used for measurements of bulk magnetic susceptibility and anisotropy of magnetic susceptibility (AMS) in weak variable magnetic fields (from 2 to 700 A/m peak values, with sensitivity up to 2 x 10-8 SI). The kappabridge is equipped with an automatic 3D sample rotator, allowing the user to measure the full AMS tensor just in 90 second. 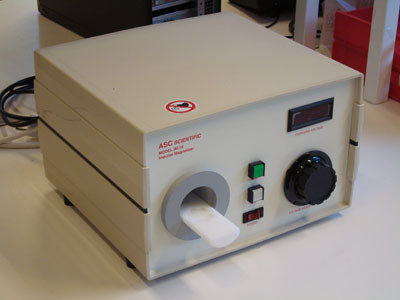 It is also equipped with a CS-4 furnace for measuring variations of magnetic susceptibility from room temperature to 700 °C in Ar atmosphere or in air, a technique commonly used for estimation of Curie temperatures, identification of magnetic phases, and testing for thermally-induced alteration of magnetic carriers. This instrument generates short duration magnetic fields within the sample coil, which causes a sample placed into the coil to acquire an isothermal remanent magnetization (IRM). 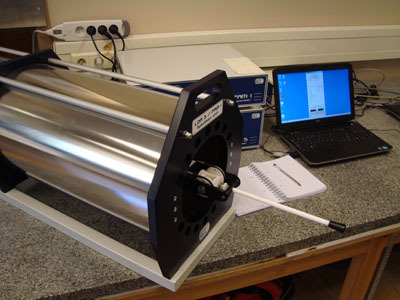 The IM-10 is primarily used in high-field magnetic studies on geologic samples. The IM-10 is capable of producing magnetic fields within a range from 0.05 to 1.1 T and is ideally suited for studies of IRM acquisition and anisotropy of IRM. The IGGL has a variety of equipment for paleomagnetic sampling in the field and specimen preparation in the lab, including gasoline-powered paleomagnetic drills, core orienting fixtures, a dual-blade rock saw, a laboratory core drill system, and tools for preparation of samples for rock magnetic measurements. Please contact the IGGL staff if you would like to learn more about that.